WOW! Courtney has done it again with this insanity inducing read. Just when you think like you have a grasp on the what’s happening, BOOM it changes. I can't tell you how many theories I had going into this book, it's anything but predictable. We continue the journey to figure out what secrets Dare may be hiding. What memories Calla is refusing to remember. We learned that Finn was dead at the end of NOCTE. But is he? 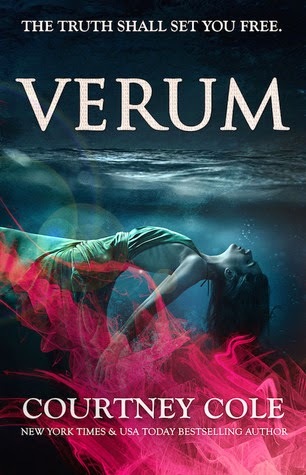 He is just as present in VERUM, as he was in NOCTE. Cala and Dare head to Whitley; Calla's mother home in England. They are hoping that this will help Calla recover all of her missing memories. Remember that Calla's mother left Whitley and moved to the U.S, and she hadn't spoken to her Mother in years. Calla and Finn never knew that side of the family. While at Whitley, Calla has a chance to connect with others from her mother childhood; mainly her Grandmother, Eleanor. Everyone wants something from Calla, we don't know what that is yet, but I have to agree with her assumptions. Dare is kind, but our relationship is complicated. Eleanor is severe, Sabine is mysterious, Jones is perfunctory. They all want something from me. This man, this priest, is kind simply to be kind. Calla is very conflicted in the book. She is slowly learning Dare's secrets. She wants to keep him at a distance. She's not sure if he is good for her. She keeps remembering Finn journal and all the warning that were written in there. Dare himself has admitted to "doing terrible things". In her heart she knows Dare, she loves him. There's tension here, but not the bad kind. It's the kind that ignites you, the kind that intoxicates you, the kind that once you taste it, you'll crave for the rest of your life. Calla needs the truth. She needs to figure that out on her own. How do you decide what is real, imagined, truth or lies, when your heart and mind are in constant battle. When mental illness runs in your family and you fear you might be crazy. As Calla starts to uncover more of Dare’s secrets, he starts to pull away from her. Calla must decide if she’s going to fight to remember for Dare. “All I can remember, all I can focus on, is how very alive Dare DuBray is making me feel in this moment, how alive he always makes me feel.” What’s the price you’re willing to pay to uncovering these secrets? Is it worth it. Nothing is as it seems in this book. I had all of these great theories when I started. They flew out the window so fast, I’m not sure what to think except: Courtney is an evil genius. She will be receiving my therapy bills, that’s for sure. There are so many pieces to this story. That writing my review 24 hours after finishing it, is probably not wise. These books make you think. You’ll be thinking about them to the point of driving yourself crazy. You will constantly be remembering a different pieces of the puzzle, that could lead to another possible twist. Definitely a must read!